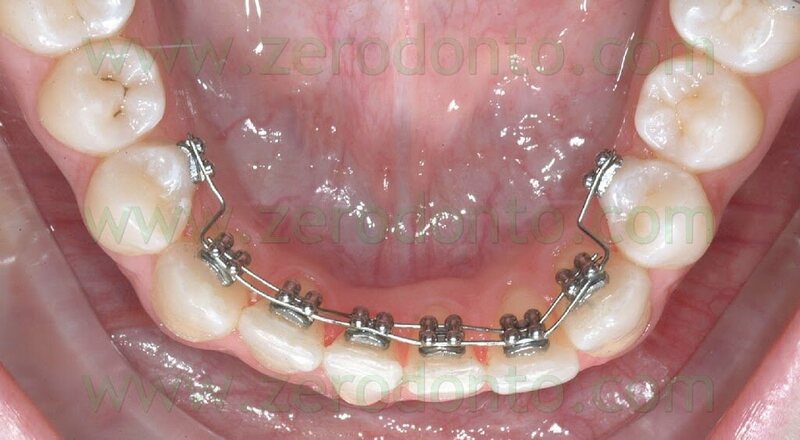 A 25 years old girl previously treated with a fixed orthodontic appliance, has come to the chairside examination becouse of the gum vestibular resorption on tooth 41, with a sensibility increase and the diffucult to keep a good domiciliar oral igyene. 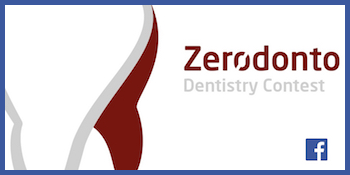 The clinical exam showed a severe gum resorption of this tooth with a buccal movement of the rooth and a traumatic contact with the antagonist because of the extrusion. 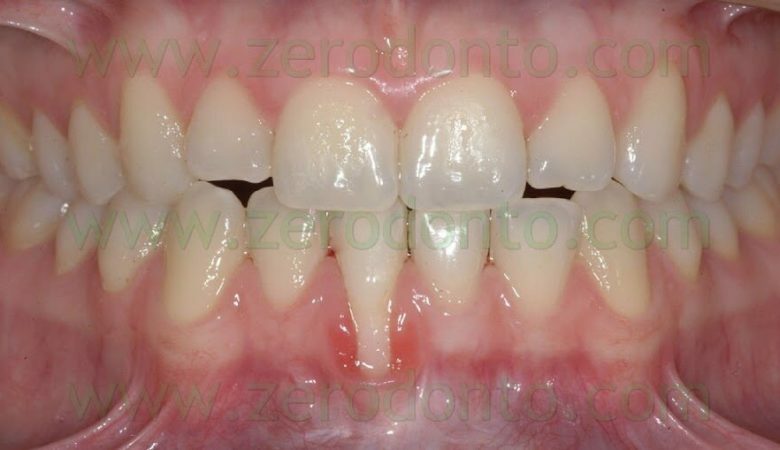 There was also a fixed contention in the lower arch from 3.2 to 4.2 that was damaged and repaired a lot of time and because of an inadeguate bonding procedure has became an active retainer. 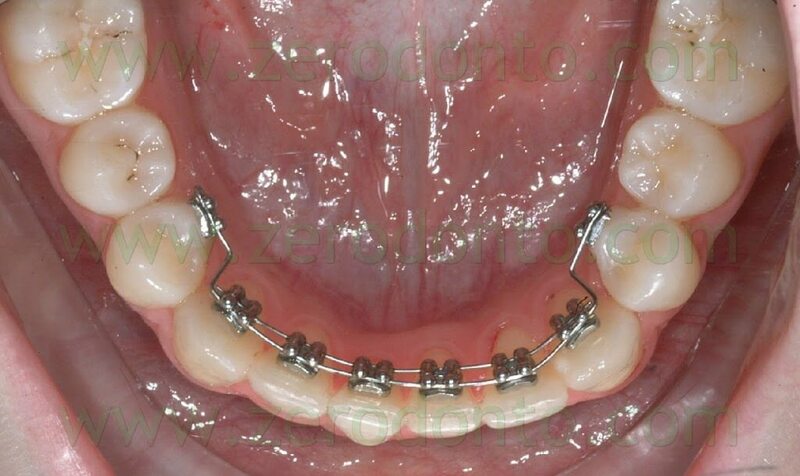 This exerted a couple of forces that generated an incontrolled radicular buccal torque of tooth 4.1. 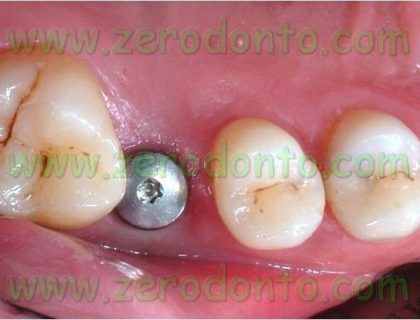 The treatment provided the removal of the old retainer, a professional oral hygiene and the application of a fixed lingual appliance by means of self ligating i-TT? 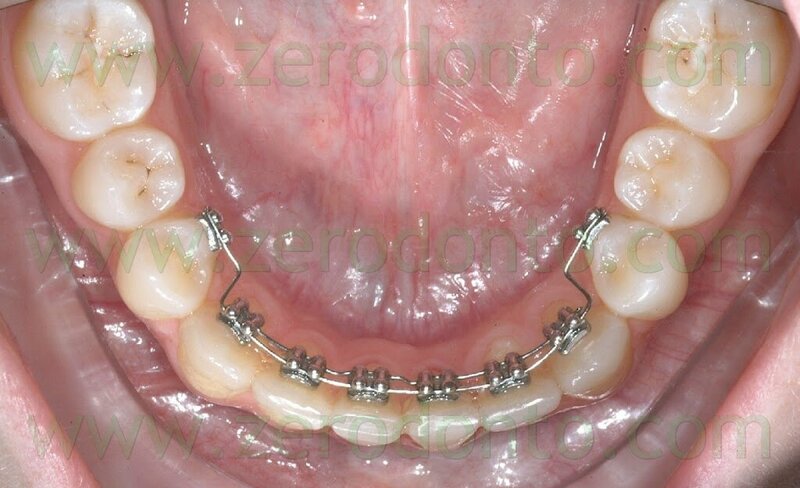 brackets from 3.4 to 4.4. 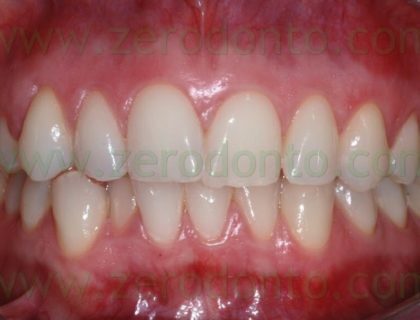 The purpose was to levell teeth, to remove the traumatic contact, to correct the radicular torque of 4.1 and to re-establish a parodontal health to let a better domicialiar oral hygiene (Figg: 01-05). 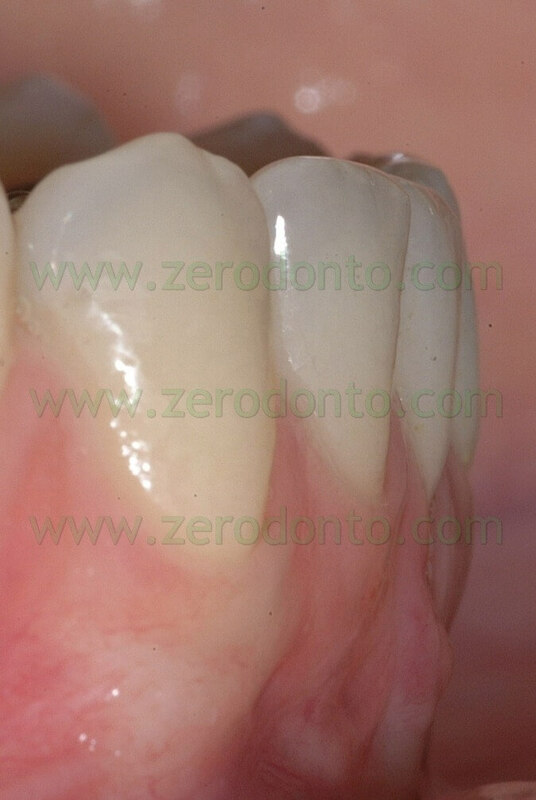 The bonding procedure was accomplished with a direct tecnique withouth a previous set-up. 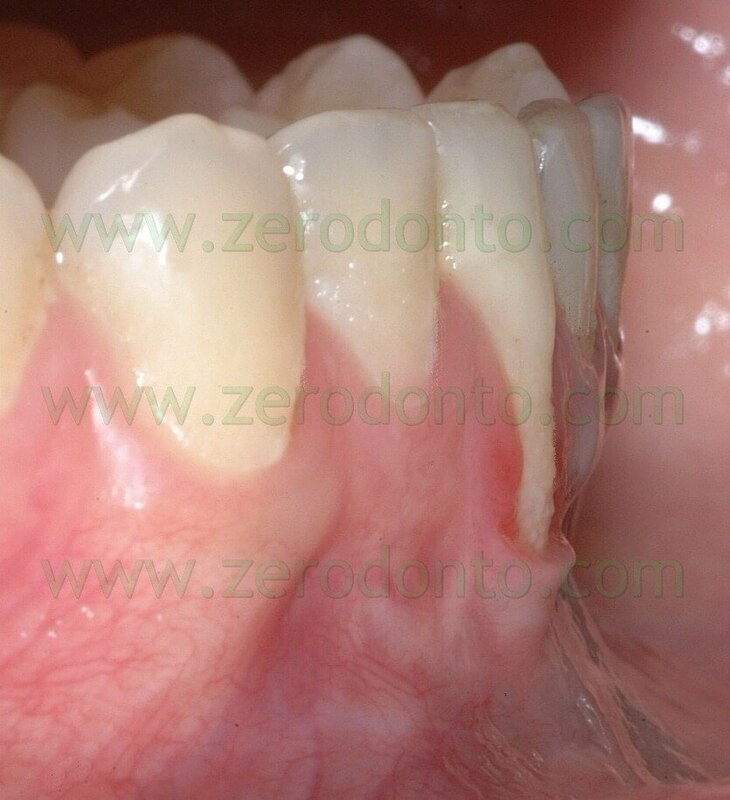 After the brackets application the ectopic position of tooth 41 rooth is more evident. 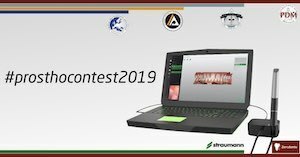 A .014 Niti arch (large arch shape) was inserted in the occlusal slot modeled with the rigth “in-out” step bends between canines and first bicuspids and with antistress distal end bends to keep the arch length. 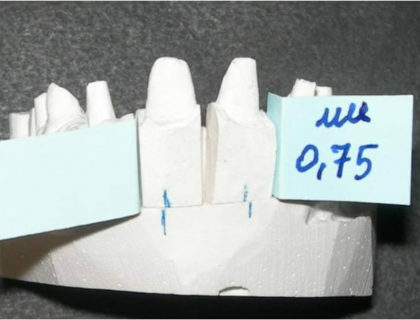 In the gengival slot of teeth 3.1 and 4.1 was inserted a 0.14 preformed NiTi sectional (small arch shape because of the arch length reduction in the gengival side) and inserted into the central tube of teeth 3.2, 4.2, 3.3 and 4.3. This let immediately during the initial levelling process the exertation of a couple of force in the frontal teeth, expecially in the central incisors, that generate a lingual radicular torque (Figg: 06-09). 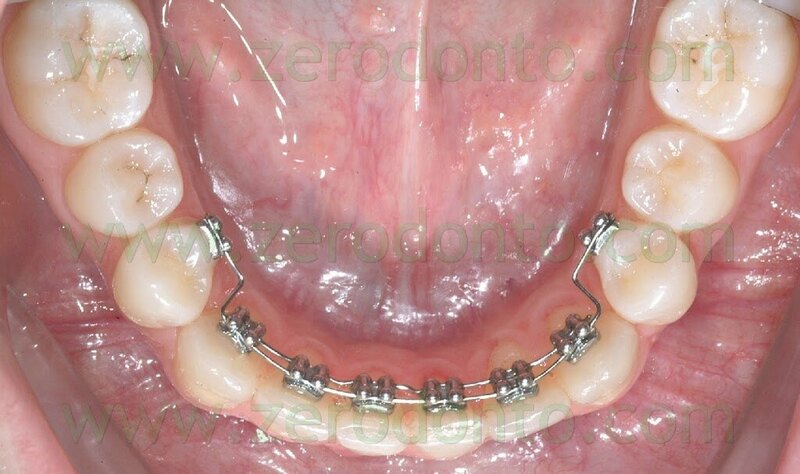 After one month from the brackets application we can see the full teeth levelling and the inizial radicular torque movement of tooth 4.1. Keeping the same occlusal 0.14 NiTi large arch it was modified the application of the other sectional from 3.3 to 4.3 now inserted in the gengival slot of the four incisors to increase the torque movement (Figg: 10-13). 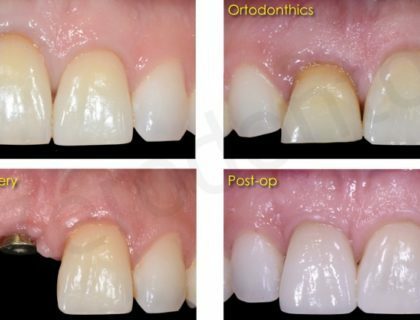 After 10 weeks the reduction of the gengival resorption of tooth 4.1 is evident together with a better radicular torque position, more evident in the lateral picture. Keeping the same occlusal arch was added a first order bend to the gengival sectional to tooth 4.1 to increase the torque correction (Figg: 14-18). 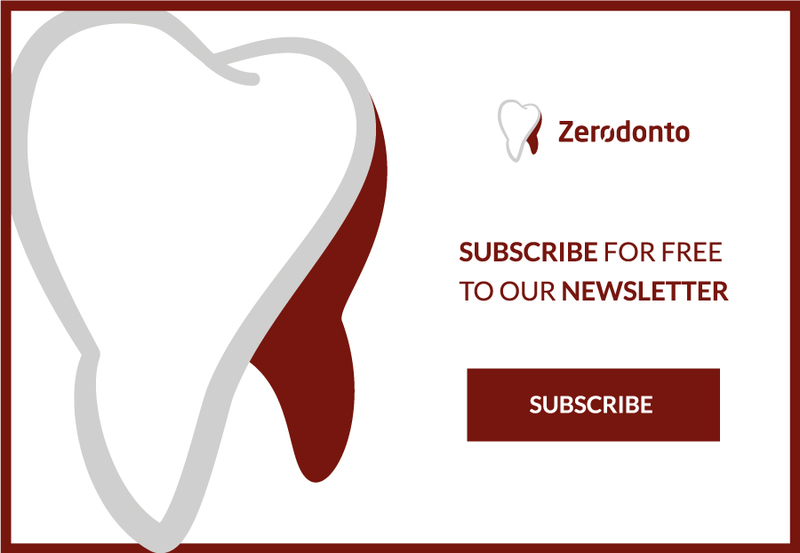 After 8 weeks, that was after 5 months and half from the removal of the old retainer and the lingual brackets bonding procedure, the orthodontic correction was ultimated. The treatment required only a .014 NiTi large arch and one sectional .014 NiTi small. 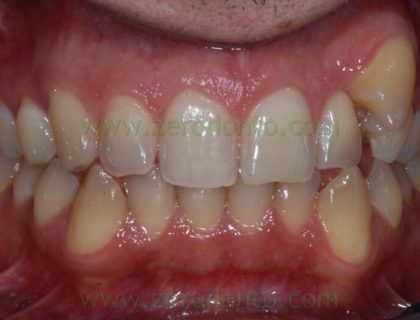 It was considerably improved the gengival resorption of tooth 4.1 togheter with the reduction of the sensibility. 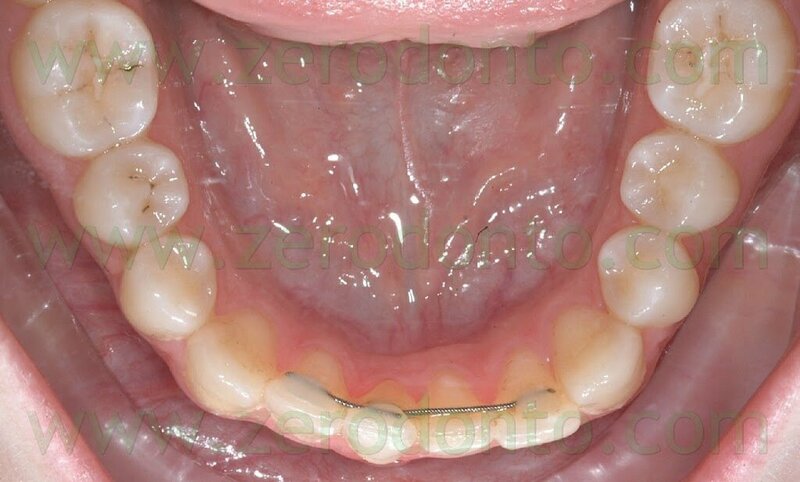 Waiting a complete soft tissues healing the lingual brackets were leaved as contention, to prevent a new relapse, also considering the failure of the previous passive retainer, with a good patient compliance and oral hygiene. 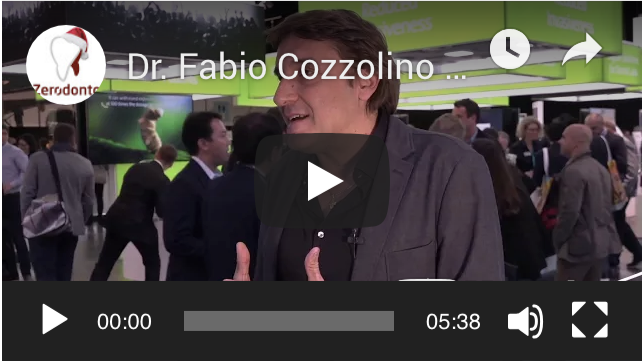 In future it will be valuated the reduction of the contention only from canine to canine togheter with the valuation of a surgical periodontal treatment according to the patient needs (Figg: 19-22).